It has been the biggest change to the University’s curriculum in three generations – an enrichment programme that has moved the institution to a semester system and created new modules designed to better immerse students in their studies. The move to a semester system means the University will use the summer term more effectively, with assessments spread more evenly across the year, and crucially, earlier assessments as well. Then there’s the introduction of an intensive four-week module to immerse new students in their course and university life. And at the start of the second semester, those first-year students will work with contemporaries from other courses through the ‘Plymouth Plus’ module, which will use problem-based learning to work on practical, real-world issues. As with any change of this magnitude – the first of its kind for 30 years – it has not come without its challenges, but as Debby Cotton, Professor of Higher Education Pedagogy, says, with the Teaching Excellence Framework on the horizon, it has been crucial that the University has been proactive in implementing new methods that will address not only teaching quality, but student support, satisfaction and retention. “The enrichment programme has at its core a focus on reducing that element of confusion for undergraduates,” she says. “If you have 12 different modules all starting at once, with no assessment until June, then it’s perfectly understandable that students might struggle in those formative weeks. By intensifying the experience, it helps students see ‘how to learn in higher education’ and make that transition from the school environment. Marine and Mechanical Engineering students were challenged to create prototypes of boats or planes using high-tech design software, laser cutters, 3D printers and a range of materials during their immersive modules. Their creations were then subjected to a day of testing, with the students competing against one another and analysing the effectiveness of their designs. 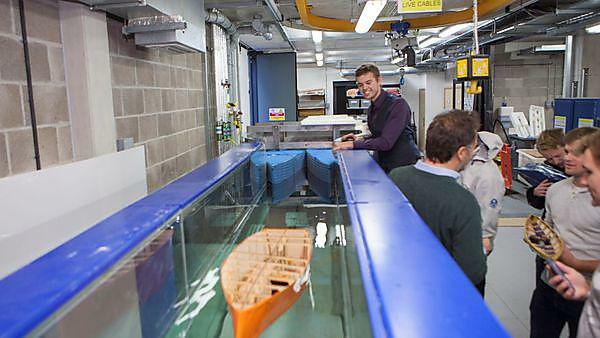 The BSc (Hons) Marine and Composite Technology and BEng (Hons) Marine Technology students were challenged to design a boat that would travel a distance of 35 metres in the fastest possible time, both empty and carrying a 1kg weight. The vessels were then tested in the wave flume of the University’s Marine Building. Meanwhile students from the BEng (Hons) and MEng (Hons) Mechanical Engineering or Mechanical Engineering with Composites, and BSc (Hons) Mechanical Design and Manufacturing courses turned their hand to aeronautical design, building monocoque gliders which were then fired from a catapult. While the introduction of the immersive module, in particular, has meant a good deal of extra setup work this year for course leaders and their teams, it has provided the impetus for many to dig deeper into their pedagogical approach to teaching. Victoria Hurth, Associate Professor in Marketing, in the Plymouth Business School, has gone to great lengths to help students settle into the module and University life by providing her first-year cohort with a timetable that sets clear guidance and expectations as to what they should be doing, when, and for how long. Victoria has increased the number of face-to-face opportunities students have, and introduced live project work that seeks to ground them in commercial realities at the outset, including a visit this year to chosen partner, Langage Farm. In both mechanical and marine engineering, first-year students culminated their immersive module by constructing model gliders and boats and testing them on campus and in the Marine Building. Frank Abraham, Associate Head of School (Engineering), in the School of Marine Science and Engineering, said that while it was important to give students a preview of the equipment and facilities they would use in their degree, it was more meaningful to have them build something and reflect upon their learning. “We wanted to create an experience that perhaps took them back to the time of their childhood – of building something physical,” said Frank. “It was then about testing and refining it to make it better – after all, we did not design the perfect engine at the first attempt! Then, in the wrap-up session, we looked at what went well and what did not go so well. In the School of Nursing and Midwifery, the emphasis of the four-week Ways of Knowing immersive module is focused more upon setting the context for the degree itself, and signposting students to where they can access help and support. If anything, say the team, students have been left expecting more nursing. But as Anna Chick, Lecturer in Child Health Nursing, says, that in itself may be a sign that the module is working as intended. The ‘Ways of Knowing’ immersive module in the School of Nursing and Midwifery introduces a number of changes for first-year students on the BSc (Hons) Nursing, covering adult, child and mental health degrees. A maths assessment, for example, immediately tests the robustness of the students’ GCSE-level qualification and flags up those who might need assistance. The cohort, which contains more than 500 students, has a number of lead lectures that are followed by a related seminar, with groups working with a single ‘seminar lead’ for greater consistency. The nursing students are also encouraged to engage in positive social media activities through the PUNC14 (Plymouth University Nursing Cohort) Twitter account, run by Professor Ray Jones. It’s a theme also picked up on by Dr Andreas Walmsley, Associate Professor in Hospitality, Events and Tourism, and programme lead for the BSc (Hons) degrees in Business and Tourism, Tourism Management, and International Tourism Management. Andreas joined the University just over two years ago and immediately began to work on the pilot phase for the enrichment project, leading to the Tourism Knowledge and Fieldwork immersive module. “When students come up to me at Open and Applicant Days and say ‘you’ve been teaching for 20 years; how do I know you’ve not been teaching the same stuff for 20 years?’ I can tell them that we wrote four new modules last year! Incorporating both the student and staff voice is something that Dr Suanne Gibson, course lead for the BA (Hons) Educational Studies, in the Plymouth Institute of Education, has been mindful of since she began the process of curriculum enrichment. Suanne says that the team is now looking at how they might reintroduce the 40 credits’ worth of core material that had to be removed from the curriculum to accommodate the immersive and Plymouth Plus modules. “We feel that it’s a significant loss from an academic perspective, but that process of discussion and debate is a healthy thing,” says Suanne. “Moving from terms to semesters; from exams to more constant forms of assessment, has undoubtedly been a major piece of work,” adds Pauline. “To get meaningful change, you have to ‘perturb the system’, so we’d like to thank all of those staff who have brought enrichment to life in their courses, and to the teams in ASTI, Learning Development, Learning Support and the Library who have supported the process. The Introduction to Critical Questions in Education intensive module for the BA (Hons) Education Studies introduces four weeks of themed learning: week one covers identity, taking a psychological, philosophical and political approach to education; week two covers social justice and inclusion; week three looks at sustainability; and week four considers the issue of space. In each, there is a timetable of full-cohort lectures (including those taken by Learning Development) with all 60 students, interspersed with small group tutorials, and at the end of the week the groups present on their learning. At the culmination of the module, students are required to submit a 2,000-word overview of their findings. “As the title suggests, we’re really looking to encourage our students to engage with critical thinking and engage with the research behind our teaching,” says Dr Suanne Gibson (pictured). “And this is aligned to some of the changes we’re seeing at policy level, especially with regard to social justice. The BSc (Hons) in Marketing has had its first year marketing module completely rewritten by Associate Professor Victoria Hurth (pictured). She has re-engineered the timetable, building in more contact time, project work and employability skills focus. For example, students are immediately thrust into working on real scenarios provided by Langage Farm, who are involved for the entire length of the module. They must also submit drafts of project work, which not only provides them with early feedback but also a chance to exercise valuable skills such as referencing. And following a successful trial last year, the students undertake a one-day business challenge, supported by the RNLI and Babcock Marine. Tourism Knowledge and Fieldwork is the immersive module that applies to all three tourism degrees within the Faculty of Business, and introduces to students the ‘scope of knowledge in tourism’ at the University. The students receive lectures from all of the academic staff, who present their areas of research by way of introduction. They are also taken on a field trip in the third week to Brittany, France, to consider questions of destination tourism, branding and culture, and both formative and summative assessments are linked to the trip. “We wanted to get the students’ hands dirty with an early field trip, and the feedback has been that it’s worked really well, both as an exercise in appreciating the formation of destination image but also to help the cohort bond and feel part of the School of Tourism and Hospitality,” adds Andreas.